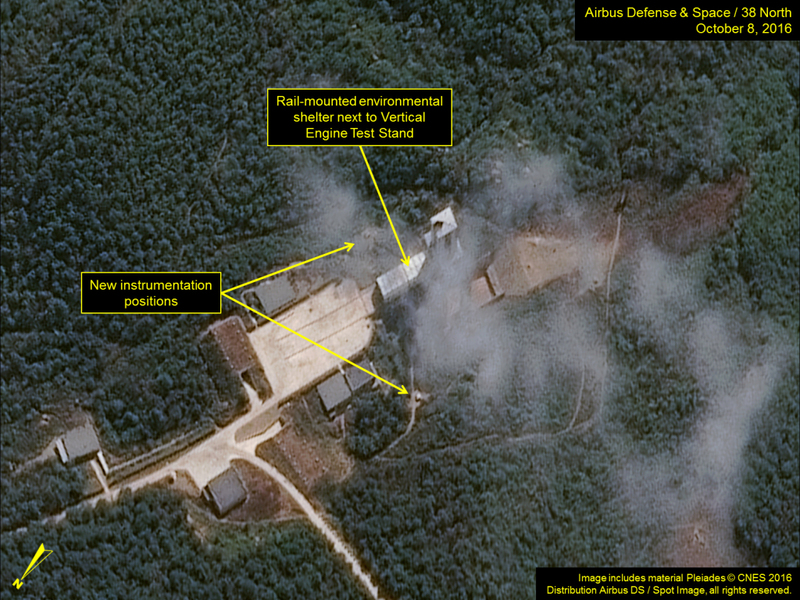 Commercial satellite imagery from October 8 continues to show a low-level of activity at and around the launch pad and vertical engine test stand at the Sohae Satellite Launching Station. 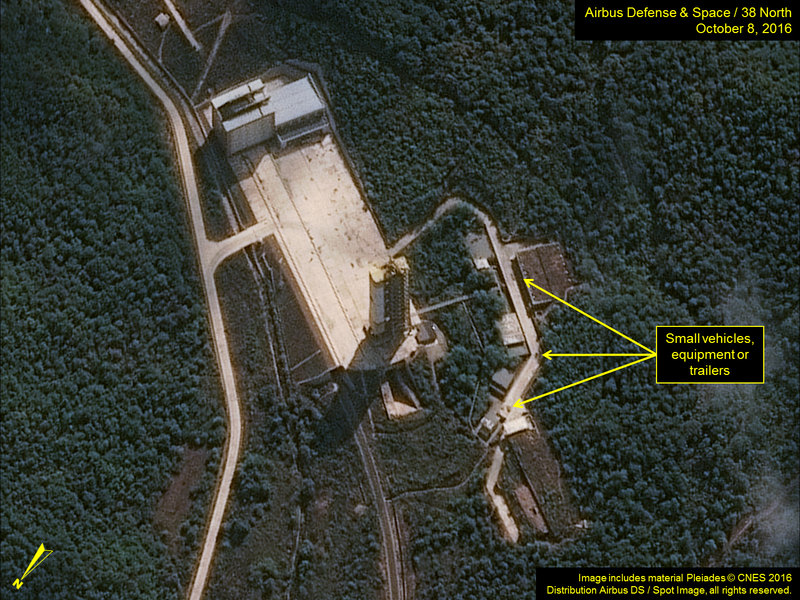 Given the absence of activities normally associated with an impending launch, such as the presence of cranes on the launch pad or activity at the VIP observation building, it seems unlikely that North Korea is planning a space launch in the near future. Instead, other activities around the Sohae facility suggest a focus on maintenance and infrastructure improvements. It remains unclear whether activity at the vertical engine test stand is related to an impending engine test or serves some other purpose. Commercial satellite imagery from October 8 indicates that a few small vehicles, equipment or trailers remain near the fuel and oxidizer bunkers. No additional activity is observed at the launch pad. At the horizontal processing building, three small pieces of equipment or shipping crates have arrived during the last 10 days. Their purpose is unclear. At the rail station next to the horizontal processing building, two rail cars are present immediately outside the covered area. These appear to be gondolas—for moving large items or hoppers—likely for the laying of rail ballast. Figure 1. Vehicles, equipment and/or trailers at the fuel and oxidizer bunkers at the launch pad. Figure 2. Activity at the Horizontal Processing Building and two rail cars at the rail station. Imagery from October 8 shows the rail-mounted environmental shelter, used to conduct final preparations on an engine before it is loaded by a crane into the test stand, remains adjacent to the vertical engine test stand. When not in use, it is normally positioned further back on the concrete pad. 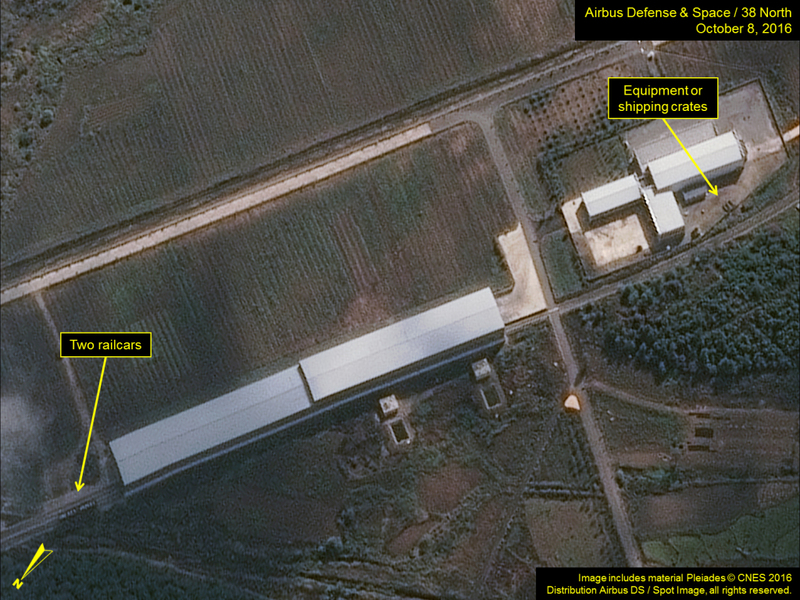 Since no crane is visible in either the October 1 or 8 imagery, the shelter’s current position suggests several probabilities, including: 1) a North Korean deception effort; 2) maintenance work perhaps related to last month’s test; or 3) preparations for a new engine test. It should also be noted that no activity is taking place at the VIP observation building overlooking the stand, where Kim Jong Un observed the September test. Since September, two small instrumentation structures have been built on either side of the engine test stand. From their positioning, they appear to be for cameras to record details of engine tests, but other instruments could also be placed within them. Figure 3. Activity at the Vertical Engine Test Stand. 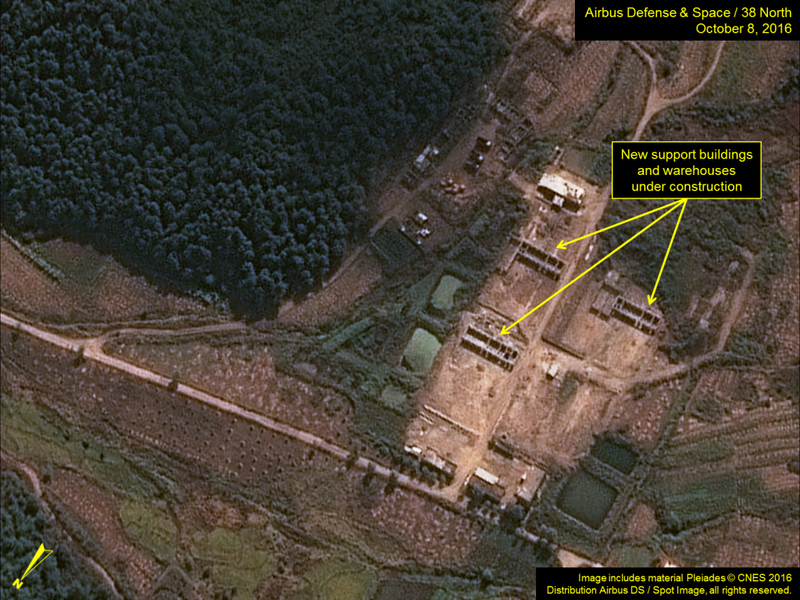 For most of the past year, the North Koreans have been razing structures in the support and warehouse area in the valley northwest of the launch pad. In September, however, new construction began on three structures that appear to be small warehouses or shops. Given the enhanced security and new housing developments noted below and in previous reports, this activity suggests long-term infrastructure development continues, which will allow the facility to be operated on a full-time basis with increased numbers of personnel in residence. Figure 4. New buildings under construction at the support area. 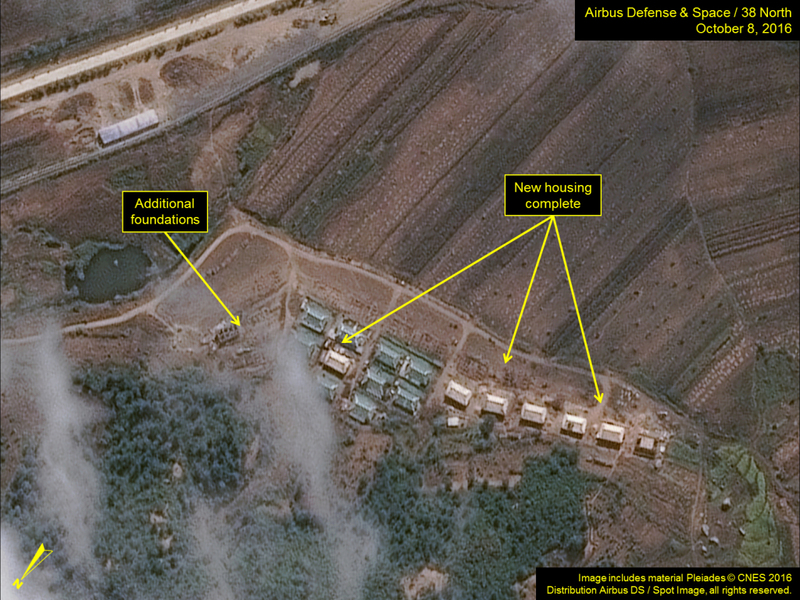 A short distance outside the launch facility’s main gate, six new housing units have been erected since August, and at least four more are under construction. Since 2014, North Korea has slowly been adding housing units in and around the Sohae facility that are typical in the size and style of those used to house mid-level military officers, technicians and managers at facilities throughout North Korea. It seems reasonable that these will be used in a similar manner here, possibly for NADA and KPA scientists, engineers, technicians and support personnel. During the past several months, two new structures have been built within the facility on the ridge just north of the launch pad. The larger of the two appears to be a barracks-style building, while the second may be for agricultural purposes. Figure 5. New housing complete just outside the Sohae facility. Figure 6. 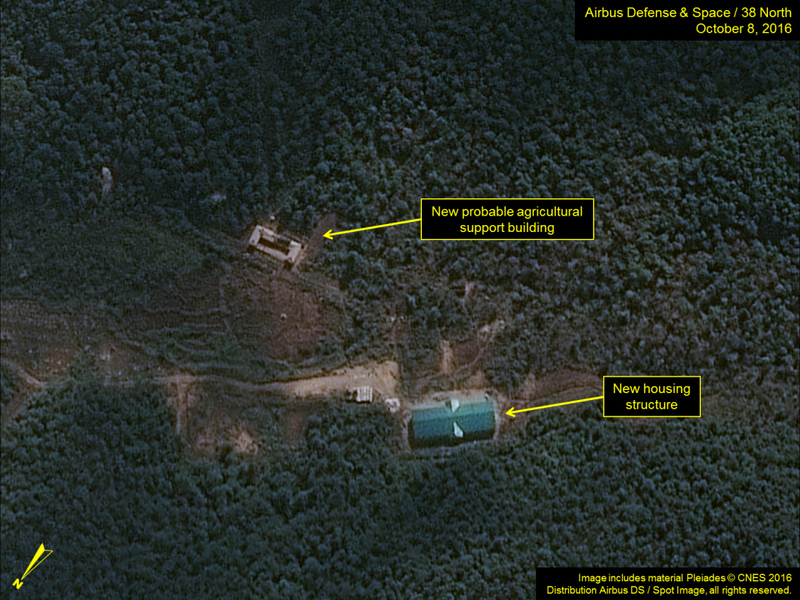 New housing and/or support structures built inside the Sohae facility. Rail ballast are the rocks between rails and rail ties to increase stability. Rail lines that are used regularly, especially those that carry heavy loads or subject to severe weather, need to be re-ballast often.